On arrival all components are completely dismantled and all wearing parts are precisely measured and results recorded. Hydraulic components that have failed are subject to rigorous failure analysis. Where necessary outside consultants provide metallurgical and engineering assistance. 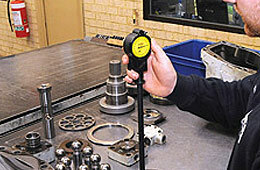 The results of these rigid inspection procedures are then used to develop an effective workscope. Specially selected, highly developed software assists in efficient and accurate quoting. This sophisticated software ensures accurate information transfer between technical staff and the quoting and procurement section. An extensive inventory is maintained, ensuring fast turnaround and reducing reliance on secondary suppliers. All surface grinding is completed in-house to maintain quality standards and a large diameter wheel is used to ensure a superior finish. 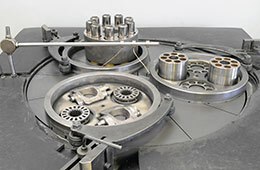 This grinder is supported by a large range of jigs and fixtures to facilitate rapid turnaround. 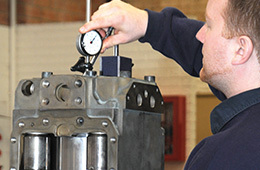 All lapping is carried out in-house on one of five lapping machines. The lapping room tables are audited daily to maintain accuracy and both flat and spherical components are catered for. Optical flats, in conjunction with monochromatic lights, are used to check flatness lapping and all lapping components are ultrasonically cleaned to remove any residue. All components are reassembled by skilled technicians with years of experience. All critical dimensions are counter checked,with measuring and equipment that is audited monthly. All critical specifications, assembly dimensions and tensioning requirements are recorded for quality assurance, and future reference. Overhead cranes with creep mode hoists enable the precision assembly of large and heavy components. 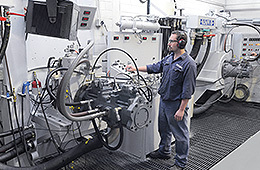 All hydraulic components are subject to exhaustive and authentic function tests using a facility unrivalled in Australia. Two test stands are available (380 and 800 horsepower ) and these can be run simultaneously. 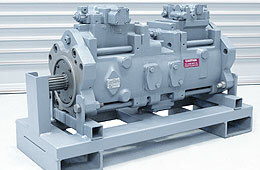 The largest pumps can be tested at full displacement and design pressures, at the correct speeds. 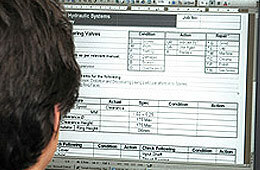 All tests are logged and analysed using Webster PC100 software. Special care is taken to protect components when testing . Oil is full flow filtered to 10 micron's and off line filtered to 1 micron. Monthly audits return NAS class 3-5 results, exceeding industry standards. Ports on repaired components are sealed with steel blanks at the completion of testing, preventing ingress of contaminants and loss of oil during transport and storage. All components are packed on appropriate skids. Unpainted, machined faces are coated to prevent corrosion.